The Balls & Chain Walleye Tournament started in September 2008 as a fundraiser to assist Casey and his family. Over 60 people came to Kettle Falls and fished in the first year’s tournament. The funds raised helped the McKerns remodel their house in Kettle Falls so Casey could return and live in his hometown. The creation of Casey McKern’s Pay It Forward charity is a direct result of the support he received and at this time, the Balls and Chain Walleye tournament is our charity’s main fundraiser. 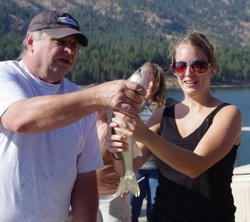 On the fourth Saturday in September, you and your favorite guy(s) or gal(s) get to spend a day walleye fishing on beautiful Lake Roosevelt near Kettle Falls. There are lots of chances to win great prizes, some cash and even opportunities to throw a monkey wrench in your biggest competitor's game plan. We wrap up our day with a fabulous catered dinner (included with your entry fee), infamous awards ceremony and a keynote from Casey. What could be better than spending your day fishing while raising money for Casey McKern's Pay It Forward?